"One of the richest and most vigorous singing traditions alive in Britain today is presented here in a form accessible to any group of singers and musicians, backed up by thorough scholarship and a deep understanding of its social background. Whether you are fascinated by popular culture and musical history, or just enjoy a really good sing, this is an essential collection." "This volume is the product of a vital musical tradition. Carol singing in South Yorkshire takes its repertory from popular church music and secular material of past times, melding them into a lively presence today involving thousands of people. It draws on oral tradition and written transmission; part singing (including the use of ‘fuguing’ tunes) is a central feature of this tradition. In his sympathetic editing, Russell uses his extensive knowledge to produce a work which is totally rooted in scholarly understanding of historical and oral sources and yet is capable of providing a cornerstone for ongoing performance." "This remarkable book is the result of Russell’s years of dedicated effort to unearth and tell the musical and social history of this carolling tradition, to document its present state, and to strengthen it for the future. Scholars, musicians, and singers will find much to learn from and to use here." The collection makes available music that has previously been locked away in private family manuscripts, thereby opening up a door to a whole new dimension of sound. 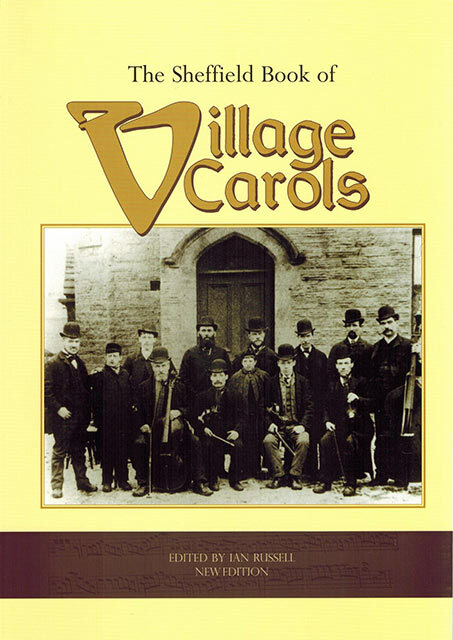 The performance of these carols to the grandeur of a full instrumental accompaniment has been a feature of the Festival of Village Carols since 1994. This music provides the means to create such performances – set in full score with most carols in four voice parts, three string parts, and a keyboard reduction. Moreover, the parts have been transposed to fall within the range of normal voices. It should be stressed that performance is also successful with keyboard accompaniment or sung a cappella. The manuscripts originate from family groups, most notably the Mount family from Worrall, whose string parts date from the late nineteenth century. They were members of a perambulating carol party known as the Big Set, which was active for at least seventy years prior to the Second World War in the Worrall, Oughtibridge, Loxley, and Wadsley districts. They were largely self-taught musicians, who learnt their art and tradition by aural/oral means. Their carols were very special to them and membership of the group was by invitation only. The two main singing parts, with their fuguing passages, characterise the tradition. The style of performance is robust and generally fortissimo, with an air of competition between the parts. The impression is of polyphony rather than sweet harmony – dramatic, animated and uninhibited. The instrumental parts are equally vigorous, highly rhythmic in fairly strict tempo, with attacking use of the bow, and minimal use of expression or vibrato. They sound just as striking on other instruments appropriate to the ‘church gallery band’ sound – clarinets, oboes, flutes, bassoons, French horns, free reed instruments, as well as brass instruments. The volume comes with a scholarly introduction that effectively explains the history and social context of the carolling tradition and its repertoire, the manuscript sources and editorial method, and offers guidance to performance. From a glance at the detailed notes to the carols, the reader will quickly be aware that the origins and development of this repertoire of highly localised provenance are complex with local, regional, national and international roots.